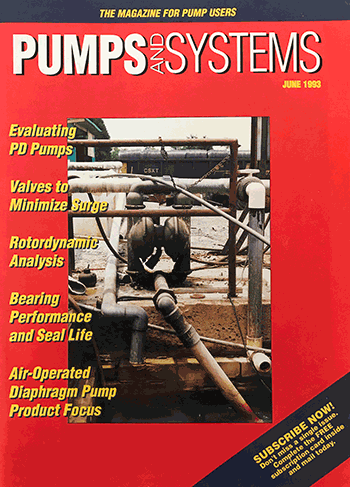 Editor’s note: In celebration of our 25th anniversary, Pumps & Systems is re-publishing articles from 1993, our first year in print. Below is the article “Effect of Bearing Performance on Seal Life” from our June 1993 issue. Bob Goodenberger, the original author, offered us an updated introduction and thoughts on how bearing performance and seal life have changed (or not) in the last 25 years. Since the article titled “Effect of Bearing Performance on Seal Life” was written and published in June 1993, there has been no real change in the cause and effect of bearings on seals. There has, however, been a change in what end users are doing about it, which has caused a positive effect on the performance of seals and on the mean time between maintenance (MTBM). The use of oil mist. This improves lubrication and reduces oil contamination by purging moisture and contaminants from the bearing housing continuously. Improved bearing isolators for the bearing housings. This helps reduce ingress of contaminants and works with oil mist to help keep moisture out of the bearing housings. Bearing housing upgrades. Most pump manufacturers and many aftermarket suppliers offer upgraded bearing housings. These housings meet all of the characteristics spelled out in API 610 current edition but, more importantly, provide enlarged shafts, larger seal chambers and improved L3/D4 ratios. All of these items contribute directly to improved bearing and seal life, increasing MTBM. The combination of these technologies drastically improves the bearing life in many facilities. 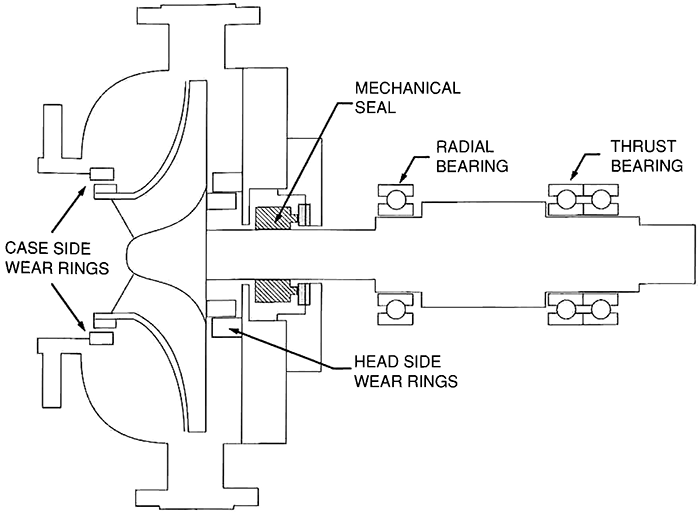 As the bearing life increases, the mechanical seal life also increases. Other items that help increase MTBM include a focus on operation of the pumps, the reduction of emissions and some new technologies in seal design. By focusing on the interaction between the pump curve and the system curve and trying to keep the operation near the best efficiency point (BEP) of the pump, operators can help to naturally reduce the vibration and excessive forces on the pump. Emission reduction regulations have caused many end users to install more dual seals. The result of this is often seals that are more tolerant of the vibrations, leading to longer life. As a subset of the dual seal installations, the increasing use of dual gas seals has improved the MTBM in many cases by allowing the non-contacting faces to move without damage to the seal faces that occurred on standard contacting seals. Technologies that are being adopted more and more by end users are affecting the life of pumps and seals positively. By updating pumps, seals, lubrication systems and controlling the flow through pumps more precisely, the amount of time that a pump spends in the field available for service and out of the maintenance shop is greatly improved. Mechanical seals play a role in containing emissions as well as providing a safe environment for plant personnel. Proper selection, operation and maintenance of the seal system are critical to good seal performance. Pump dynamics and bearing performance will also have an effect on seal performance (see Image 1). Seal designs account for temperature, pressure, corrosion, wear and normal pump dynamics. All of these parameters must be within normal limits for the seal to operate satisfactorily. Pump dynamics include shaft movements—both radial vibration and axial movement (see Image 2)—and temperature changes. Temperature changes should be limited to normal process temperature swings. Temperature transients—swings from ambient to high temperature—should be avoided whenever possible, because this can cause thermal distortions and lead to wear and leakage. Image 2. 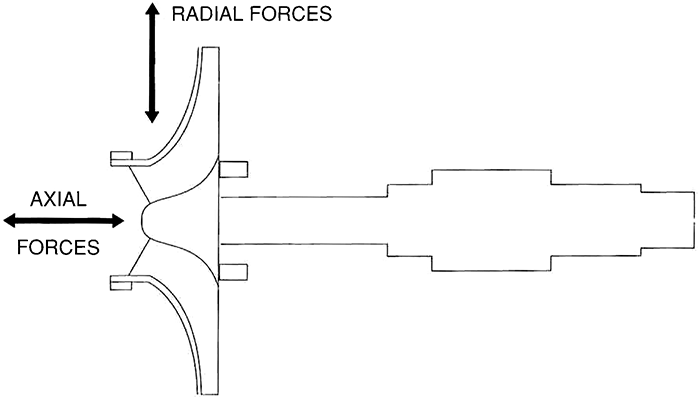 Axial and radial forces. There are many times that pump dynamics are not as stable as the pump and seal designers would like. The result is that seal performance is affected, even though there may be other areas of the pump that are beginning to fail but are not recognized because the seal is more obvious. The more common dynamics that cause seals to leak are vibration, pressure pulsations and shaft movements. Any of these can directly cause the seal to leak. They may also cause the bearings to weaken and fail, which in turn causes the seal to leak or be damaged.